BEIRUT (AP) — Iraq prevented a North Korean plane from entering its airspace on suspicion it was carrying weapons for Syria, prompting praise from the U.S. on Friday but also demands for a ban of Iranian aircraft with similar suspect cargo. Iraq's decision could potentially close a supply line for Syrian President Bashar Assad's embattled regime, which is fighting a civil war against rebels trying to topple him. U.S. officials have accused Baghdad of allowing Iran — like North Korea an ally of Syria — to fly weapons to Syrian forces through Iraqi airspace, a charge Iraq has denied. "We urge the government of Iraq to take additional steps to prevent others, including Iran, from abusing its airspace by shipping arms to Syria," U.S. State Department spokesman Michael Lavallee said, calling the move to ban the North Korean flight a "positive step." Syria's conflict has reached in a bloody stalemate, with neither side able to deliver a knockout blow, while the international community has failed to come up with a plan for ending the violence. Activists on Friday raised the number of people killed in the past 18 months to nearly 30,000. Daily tolls have been rising in recent weeks, with the regime attacking from the air and some rebels using heavy weapons. The new U.N.-Arab League envoy to Syria, who started his job three weeks ago, said Friday he is not in a rush to devise a new roadmap to peace after his predecessor, former U.N. chief Kofi Annan, failed to get his proposal implemented. "Following the failure of Kofi Annan's six-point plan, I don't think we are capable of withstanding another failure," Lakhdar Brahimi told the Al Arabiya TV station. Assad, meanwhile, was adamant that the rebels "will not succeed." In comments published Friday, he also said a foreign military intervention such as the one that helped topple Libyan leader Moammar Gadhafi will "not be repeated" in Syria. Both sides have foreign backers. Assad's allies include Russia and China, along with Iran and North Korea, while the rebels are supported by the U.S. and Western allies, Turkey and several Gulf states, such as Qatar and Saudi Arabia. On Wednesday, the U.S. Treasury Department identified 117 Iranian aircraft it said were ferrying weapons to the Syrian regime. The department said the planes were delivering weapons and Iranian forces under the cover of "humanitarian" shipments. Iraq has accepted Iranian assurances that it is not using Iraqi airspace to smuggle weapons into Syria, the Obama administration's choice for ambassador to Iraq, R. Stephen Beecroft, said earlier this week. Iraq's ban of the North Korean flight came on Thursday, after Pyongyang requested to fly a plane to Syria through Iraqi skies. Government spokesman Ali al-Moussawi confirmed the move a day later, saying it was made over suspicion the plane carried weapons. Iraqi Prime Minister Nouri al-Maliki, an ally of Iran, has denied that he is allowing weapons trafficking and has said Baghdad will remain neutral in the Syria conflict. Iraq rejects "any arming activities through Iraqi territories or skies," al-Maliki said Friday. The issue has been an enduring sore point between Baghdad and Washington, raised again in a phone call Friday between al-Maliki and U.S. Vice President Joe Biden. The vice president spoke of the need "to prevent any state from taking advantage of Iraq's territory or air space to send weapons to Syria," the White House said. Meanwhile in Damascus, Assad lashed out at Gulf countries, which he accused of using their enormous oil wealth to try to drive him from power. He singled out Saudi Arabia and Qatar, among his most vocal critics. "They think their money can buy geography, history and a regional role," Assad was quoted as saying in the Egyptian weekly Al-Ahram Al-Arabi. "They are giving terrorists weapons and money with hope of repeating the Libyan model," he added. "Instead of helping regional stability, they are supplying armed elements with weapons and training in order to weaken the Syrian state." The upheaval in Syria presents an opportunity for the Gulf's Sunni rulers to bolster their influence and possibly leave Shiite powerhouse Iran without its critical alliances that flow through Damascus. Assad's regime is led by the minority Alawite sect, an offshoot of Shiite Islam. Syrian Information Minister Omran al-Zoebi later told state-run TV that the president had received nine Egyptian journalists and had a chat with them about the latest developments. The minister said none of the journalists took notes as the meeting was considered a "personal visit," but a reporter for Al-Ahram Al-Arabi published some of what was said. In the meeting with the Egyptian journalists, Assad was also quoted as saying that the only way to solve the Syrian crisis is through "dialogue with the opposition" and that the "door for dialogue is open." Most Syrian opposition groups reject any talks with the regime, saying they will not accept anything less than Assad's departure from power and the dissolving of his regime's security agencies. One of the opposition groups, the National Coordination Body for Democratic Change in Syria, on Friday accused the regime of being behind the disappearance of two of its leaders. Abdul-Aziz al-Kheir and Ayas Ayyash were expected to take part in a conference Sunday in Damascus by some 20 Syrian groups that are calling for Assad to step down. But they disappeared Thursday along with a friend who had picked them up at Damascus International Airport, the group said. The group's head, Hassan Abdul-Azim, said the regime was believed to be behind the disappearance. The state-run news agency SANA quoted the Interior Ministry as saying "terrorist groups" kidnapped the three, and that a search has been launched. Abdul-Azim said the opposition wants a "new regime that represents the will of the people." He said his group will go ahead with the conference. The gathering will invite European ambassadors and envoys from China and Russia. Openly disparaging the regime has always been taboo and fraught with danger in Syria, although some have grown emboldened because of the uprising. Also Friday, the Britain-based Syrian Observatory for Human Rights said nearly 30,000 Syrians have been killed during the conflict. The Observatory's count includes 20,935 civilians; 1,153 army defectors fighting alongside the rebels; and 7,141 Syrian troops fighting for the Assad regime — which gives a total of 29,229, said the head of the group, Rami Abdul-Rahman. The list is compiled from reports by witnesses and medical staff, he said, adding that he only includes those identified by name or whose death was authenticated by amateur video. The Syrian military rarely releases figures on troops killed. 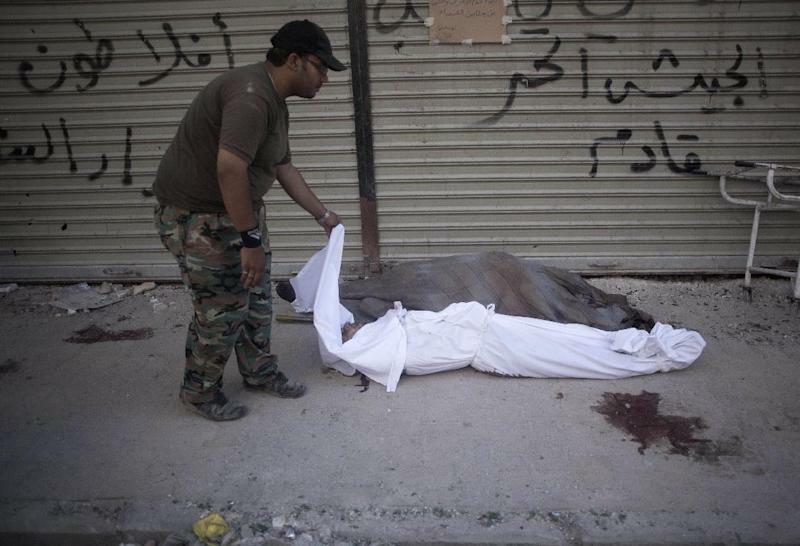 Another Syrian opposition group, the Local Coordination Committees, put the overall death toll at 26,405. However, its count does not include Syrian troops killed in battle. The LCC relies on a network of activists in Syria to collect its information. Activists and pro-government media reported fighting in several locations on Friday, including Syria's largest city, Aleppo, and in the capital Damascus. The state-run news agency SANA said government troops retook the Damascus suburb of al-Hajar al-Aswad. SANA also said troops found a mass grave containing 25 blindfolded and handcuffed bodies in the al-Qadam suburb of the city. The agency said the dead were people who had been seized by rebels. The Observatory said 57 civilians were killed across Syria on Friday, including several children who died in regime shelling attacks. The group said 28 Syrian soldiers were also killed. 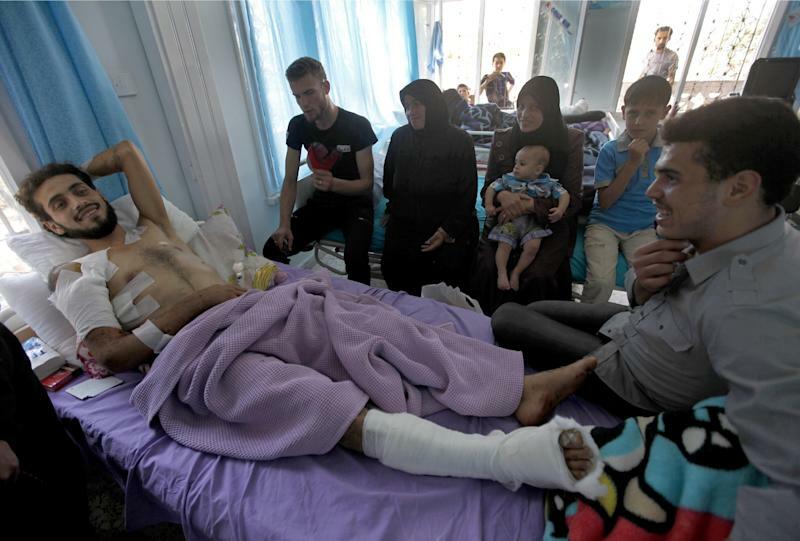 Associated Press writers Sameer N. Yacoub in Baghdad and Bradley Klapper in Washington contributed reporting.